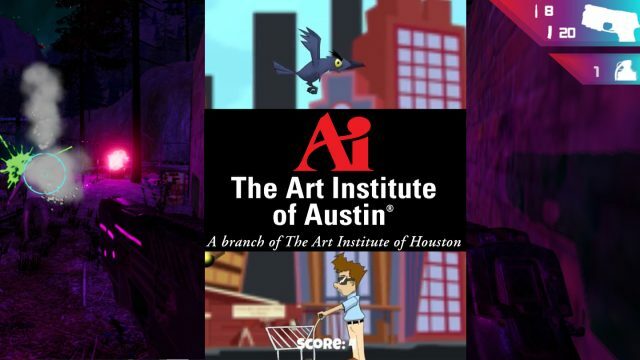 The Art Institutes will return March 15-17 for another action-packed Gaming Expo at SXSW, showcasing games from the talented students at The Art Institute of Austin, The Art Institute of Houston, and The Art Institute of San Antonio. At The Art Institutes’ booth, Gaming Expo attendees can try their hand at playing games designed and developed by our students. Among these entertaining games is Hurt—a 1980s-inspired first-person, sci-fi action shooter game and ambitious production from students in their final year of the Bachelor of Fine Arts in Game Art & Design program at The Art Institute of Austin. Hurt is accompanied by an original soundtrack created by a 2017 Bachelor of Science in Audio Production graduate. In our featured demo of Mother Gr@ckle, visitors will also get the chance to experience life as an angry grackle flying through the city of Austin, dodging obstacles and taking aim at the pedestrians and freshly cleaned cars below. Still undergoing finishing touches, Mother Gr@ckle is a production developed by first-year Game Art & Design students from AI Austin. For a taste of what to expect, check out our 2017 Inside SXSW Gaming video. The Art Institute of Austin and The Art Institute of San Antonio are branch campuses of The Art Institute of Houston.